Following a minor altercation with the warden in Ward No. 8 of Tihar Jail, Zohara Baratali received severe blows on her lower abdomen that made her bleed for a full month before she succumbed to her injuries. That was a decade ago. Last year, unable to bear the trauma of being stripped, beaten and sexually assaulted by three policemen inside Pratap Nagar Police Station in Jaipur, Seema Singh tried to end her life by jumping in front of a train. She did not die, but became a paraplegic for life. That did not deter the authorities from arresting her. Last week, the hearing for her bail application was adjourned, yet again. The All India Meet on Women Prisoners & Custodial Violence held in Delhi on the weekend threw light on the plight of women prisoners in the country. 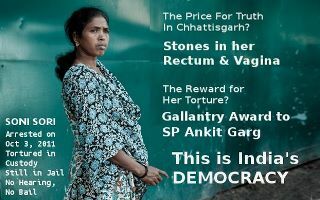 Custodial violence, which is illegal and has no sanction under law, is a part and parcel of the system, with Soni Sori’s case having brought it into the forefront. The speakers shared their concern over the use of women’s sexuality to torture and criminalize them, with police reports usually mentioning these women as those with ‘low’ character. According to them around 99.9 per cent of women prisoners in the country belong to the backward Dalit, Adivasi and minority communities. Trade Union activist Anu said, “The class divide runs deep in jails. If you are dressed well and look affluent, you won’t be asked to do a lot of the work. But others have to be on their feet all the time, even an 80 year old woman is not spared.” Speaking of her days in Tihar Jail, Anu said that the moment one enters the jail, even as an under trial, the perception is that the person is a criminal and an atmosphere of fear is created. Violence and abuses are a part of that fear psychosis. Rampant corruption goes hand-in-hand behind the bars, says Anu. The solar heating system that was installed with much fanfare at Tihar is non-operational till date. Instead, Rs 10 per bucket is charged for hot water from the langar. Inside the jail, a mobile phone costs Rs 15000, a charger Rs 2000, a sim card Rs 1500 and a missed call Rs 50. Well off or gunda-like criminals can afford these and also good food from the canteen. There is space for 250 persons, but 500 occupy it. Fights for space are regular and ugly. “If a woman is charged with a crime, her mother in law is picked up from a remote corner of the country and locked up too. Entire families are languishing in jails. Many of them do not know even after five-six years in jail, why they were picked up in the first place,” said Anu. Tihar is not the only overcrowded jail in the country. In Central India there are approximately 2,500 female under trials in jail, of which 2,000 are from Operation Green Hunt areas, said Sudha Bharadwaj from PUCL Chhattisgarh and an advocate. “Around 132 women are in the Jagdalpur jail, most of who were picked up in Naxalite cases. The jails are badly overcrowded, and more than 20-30 are at times squeezed in rooms which have a capacity of 6,” she said. The jails sometimes have only one latrine for women, and that too with no door and in full view of male guards, she added. In Naxalite areas, the military keeps tribal girls within their camps in the name of custodial protection. Why is there no paperwork in such cases, asks activist Indira. In conflict areas including Kashmir, women are in a particularly vulnerable position with heavy military presence and the recourse to justice non-existent. Anjum Zamarud Habib from Kashmir spoke about how basic rights get suspended the moment the police picks up someone. “Slaps, abuses, snatching at clothes. I fail to understand how one woman can do this with another woman?” she said. A scientist by profession, Nisha who is also a rights activist experienced the worst humiliation of her life when she set her foot inside the jail, even though she escaped some of the bad treatment due to her city bred appearance. Shamim spoke of how female prisoners were not given sanitary napkins and had to use moth eaten blankets as pads. She spoke against the forceful and unnecessary pregnancy tests, where men are also present and the person conducting the test does not even change the gloves. Though there is a law in place that women cannot be arrested by the police after sun down and before sun set, under AFSPA it has been happening in Kashmir. In even places like Bhopal women rag pickers belonging to the Pardhi community are randomly picked up. Pardhis are considered a criminal tribe even today and the perception is so strong that the Pardhi women and men are jailed for any ‘crime’ occurring in the neighbouring areas, Prema from Bhopal said. “It is heartening that our judgments read out in Supreme Court say a lot of good things in English about dignity and rights. But the reality of local thanas is far removed from it all,” said Vrinda Grover, advocate and human rights activist. Amongst strategies to fight custodial torture and sexual violence, the need for strong legal aids was stressed. Prison manuals clearly chalk out prison visitation rules but they are hardly adhered to. They must be made functional, felt the participants. The entrance and exit of police stations should have closed circuit television systems to keep track of who is coming and going, said Sudha Ramalingam, PUCL Tamil Nadu.